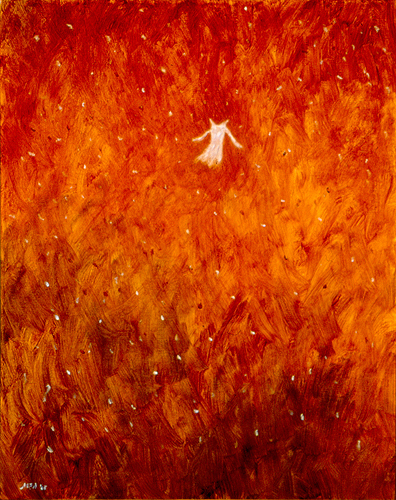 My still life oil painting, “White Dress”, was inspired by a vision of a tiny white dress floating in a vast open sky. While working on the painting, I managed to make the delicate-looking dress full of free-spirit and bravura, as it floated against an intense red backdrop, whose hues shifted and varied mercurially, like raging flames. Small, and delicate, yet the small white dress flew on, nonchalantly, unconcerned with its own vulnerability, however threatened by the menacing environ. The success of this painting gave me an impetus to continue the probe of the psyche of a personified white dress, and embarked on a journey of making a series of white dresses, objects I judged perfect to reflect or stand in as the bodies they are to clothe, as documented in this article: “White Dress” Series Continues – A New Drawing and a New Painting. This painting was also part of my Apocalypse Series. It was selected for juried exhibitions at 4th National Juried Exhibition, Prince Street Gallery, Chelsea, Manhattan, New York, 12 – 30 July 2011, and ViewPoint 2007, 39th Annual National Juried Art Competition, Cincinnati Art Club, Ohio, November 2007. 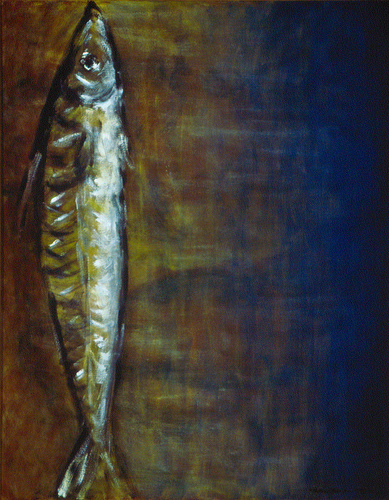 I am very proud of my 2007 oil painting “Mackerel”, in which I managed to capture both beautiful and sinister elements of a daily object, fulfilling a most tantalizing pursuit of mine. With its intense colors and bold strokes, this painting economically presents a sleekly fish, intently staring upwards, as if ready to confront its captor; at the meanwhile, its eye also betrayed the fish’s sad resignation to its imminent demise. The background of the painting was plain drop cloth, hatched lightly, and dominated by sickly greenish-yellow from the left and graduated to an intense blue to the right. The intense vertical blue patch also represents the deep water being turned upright, in a disorientated world. This painting was just awarded of 1st 2015 ArtSlant Showcase Winner. It was also selected for exhibition at ViewPoint 2009, 41st Annual National Juried Art Competition, Cincinnati Art Club, Ohio, November 2009. This painting was included in two-person show at Trilogy Studio, San Francisco, 2011, and it was exhibited at Artist-Xchange Gallery, San Francisco, in 2009.